Aleš Hrdlička (1869–1943) of the United States National Museum, was a Czech anthropologist whose specialty was anthropometry. He had moved to the United States with his family as a boy. Hrdlička founded and became the first curator of physical anthropology of the U.S. National Museum, now the Smithsonian Institution National Museum of Natural History. He was the founder of the American Journal of Physical Anthropology. 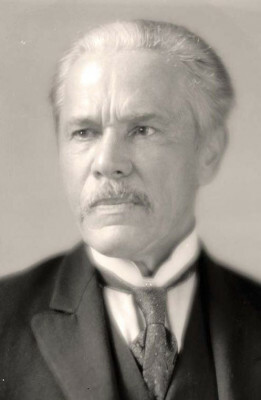 Along with archaeologist Edgar Lee Hewett, Director of Exhibits for the Panama-California Exposition, he chose exhibits that told “The Story of Man Through the Ages” with particular emphasis on the Indians of the Americas. He persuaded the national Museum, an adjunct of the Smithsonian Institution, to send exhibits for the Science and Education Building. When he prepared the exhibits for the San Diego Exposition, the ideas for which he became recognized as a leader in physical anthropology were in a formative stage. He thought Homo sapiens derived from Neanderthals, an idea that anthropologists generally discredit today, and that American Indians came across the Bering Strait after the last Ice Age, a migration that anthropologists generally regard today as occurring during the Ice Age. Hrdlicka is vilified today by many Native American tribes for digging up the graves of their ancestors. …see Wikipedia and the books All the World’s a Fair by Robert Rydell and Balboa Park and the 1915 Exposition by Richard W. Amero.